This just makes me smile. Are they yours? Amy, I love all your works! I can't just favorite one, I've got to add you to my watchlist. ;o)) You are great at colored pencils...do you use PRISMA? 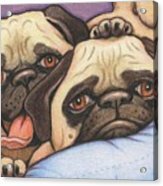 Love these puggies!!! Thank you for the on Leo. Your dogs are so cute also. Nicely done. Thanks for your nice comment on my Sunning Longhorns. I love this piece of yours and I love a lot of your work. Your animals and birds have such character. 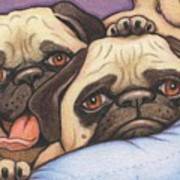 I love pugs! This was well done! I'm putting this as one of my favorites. These adorable pugs warmed my heart! I can feel the excitement they are feeling as they wait for that cookie. Wonderful drawing Amy. Too cute! Like Tina, love the paw on the head! Your work is great! Very nice colored pencil work!! Cute! I love the paw on the head! 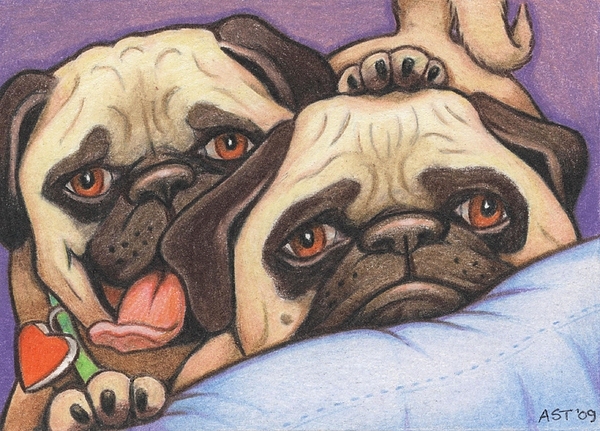 Original Artist Trading Card - 2.5inx3.5in - colored pencil on bristol - How can ya resist a face like that??? This card was made for a 1/1 swap of the trader's pugs on illustratedatcs.com . They never fail to make me laugh!